Sadness came to THE DARK VAULT OF PUBLIC DOMAIN this week. On Monday, July 22 at about 4PM, MOLLY “OXNARD” LETKIEWICZ passed away peacefully as she rested in UNCLE PETE’S arms. MOLLY, who has appeared in numerous DARK VAULT episodes as UNCLE PETE’S trusty sidekick OXNARD, had just turned 16 on April 18, 2013. UNCLE PETE and MOLLY first got together when she was just 8 weeks old when she picked UNCLE PETE to be her best buddy for life. 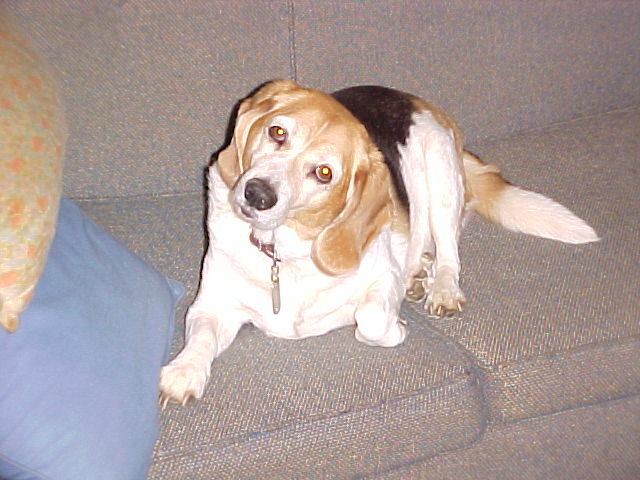 When UNCLE PETE had travelled to near Page Lake, PA to get a new puppy, he was shown MOLLY and her 4 brothers and sisters. As the four other puppies sat huddled together, MOLLY came over to UNCLE PETE, sat in front of him and said “I pick you!”. UNCLE PETE and MOLLY were inseparable from that moment on, sharing countless adventures, projects, and very special moments. From her first appearance in Season One’s New Year’s Eve Show to her final appearance in the upcoming Brand New Christmas Show (to be premiered in December 2013), she was a natural actress. She never needed instruction or direction. When the camera was on, she would place herself in the perfect spot for the shot and perform perfectly in whatever way the situation suggested. From her loving attentiveness when UNCLE PETE was setting the scene, to situating herself in a regal manner when UNCLE PETE was moving the plot along, to her comical indifference when UNCLE PETE was rambling on with some of his extended wackiness, Ol’ OXNARD always seemed to perform the perfect ad lib. MOLLY was somewhat of a ham too. Whenever anyone would pull out a camera and start taking pictures, MOLLY would begin posing, sometimes actually talking to the camera holder if she didn’t receive attention and have a couple of shots taken of her. She was an incredibly intelligent dog, often making up her own games, learning tricks and procedures after only one demonstration, figuring out just about anything on her own. She was very well-behaved and polite and was a very conversant girl, but never noisy or rude. At a very early age, MOLLY and UNCLE PETE were able to communicate an incredible amount without any words or sounds. She was also a very loving and understanding dog, always there to comfort her family if they were sad or ill. When UNCLE PETE’s Mom was recovering from surgery several years ago, MOLLY spent every night sleeping next to her, gently leaning against her, until she fully recovered. 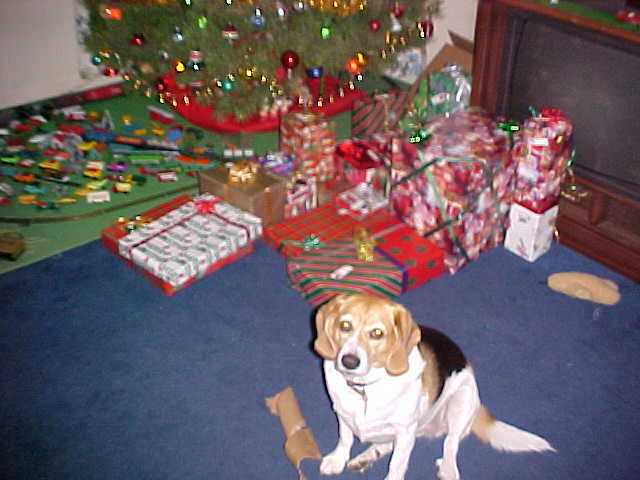 MOLLY loved rides and baths and ice cream, and walks and investigating in the woods and making up new games and Christmas and opening her own birthday and Christmas presents and, of course, food. She loved being with her family and most of all, she loved being with her family when they spent time at Lake Dark Vault. That was her favorite place in the world! She was free, walking about sniffing around, snoozing in the sun, sleeping under the picnic table, picking blue berries off the bush (only the ripe ones! ), and just sitting in the grass next to her best buddy, UNCLE PETE, looking off over the water, enjoying life. She was happy to spend her last days at the place she so loved. Soft and silky, fun and adventurous, intelligent and clever, understanding and caring, tough and gentle, a natural actress, a great protector, and most of all, a big bundle of love, we at THE DARK VAULT were blessed to have her among us. MOLLY and UNCLE PETE truly are Best Buddies Forever. Thanks, OXNARD, for all the good memories. You’ll be in our hearts forever. Good night MOLLY, I love you! ~ by UNCLE PETE on July 24, 2013. Such a beautiful girl. Uncle Pete, you have my love and sympathy. Even though I never got to meet Molly, it’s not hard to see how she touched those who knew her, including your viewers.